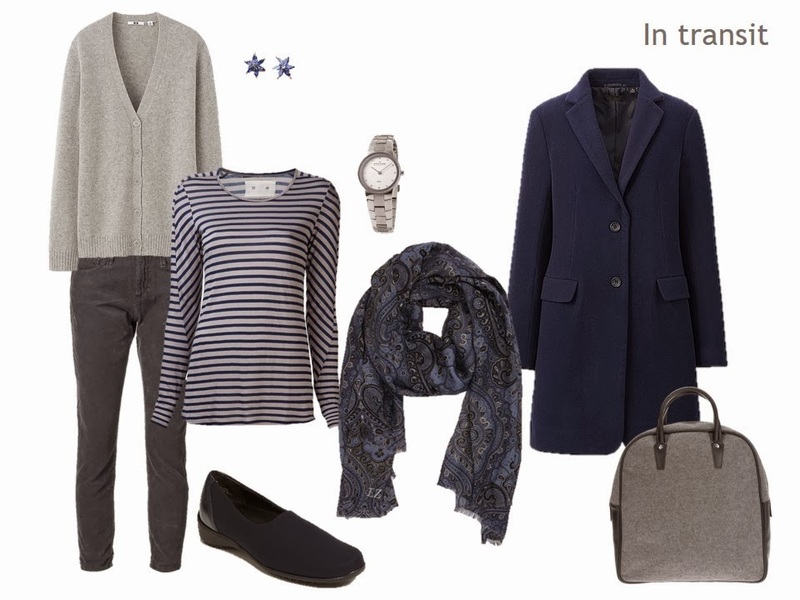 First off, choose your travel outfit using any combination of the two colors. I usually opt for a cardigan and pants that are the same color, and then use the 2nd color for shoes and a coat. A printed tee shirt, and a printed scarf, that include the 2 colors, finishes off your travel outfit. Your watch and your bag will of course be in one of your neutral colors, and a simple pair of stud earrings give you some dressiness and finish, without being fussy or getting in your way when you’re juggling your other gear. Another scarf, another pair of shoes, a necklace, and you’re set! Now you have four outfits, at least, good for a variety of events and activities. 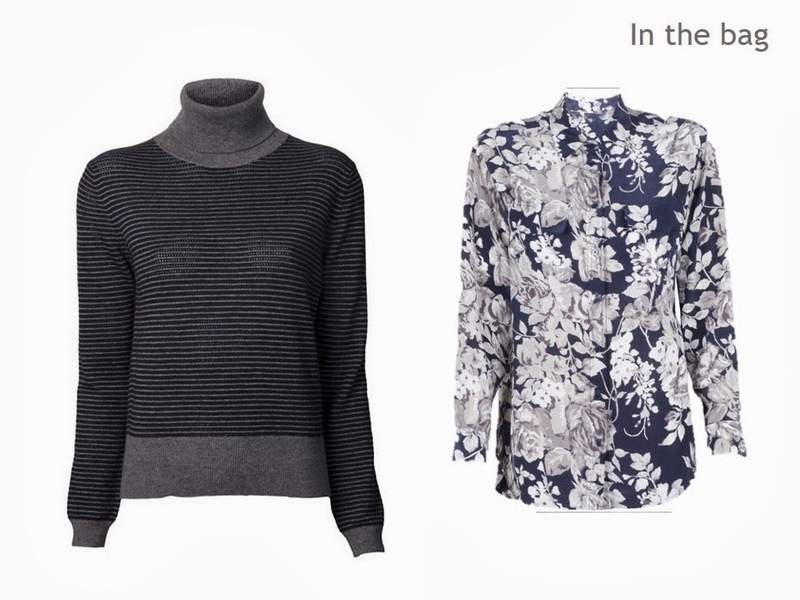 But if you’re going to be gone a few days longer, or you can’t bear traveling with only 4 garments, or you want to substitute for one of the other tops, here are a couple of additional choices. Again, I just look for items that include both neutral colors, and which offer a couple of different “moods”. I have become a huge fan of your travel vignettes also and used them very successfully. The first time I had to hold my breath, but now I am a convert. The last few times I started with a pair of pants and a long sleeved silk tee (that I knew could be washed and hung to try in the hotel bathroom), and took it from there. It's been quite a revelation. My friend's husband recently picked me up at the airport, and his first comment was: 'Is that all you brought?' Yep! On my computer screen these colors appear to have a touch of purple to them. I feel that navy and grey look flat on me, but amp the colors up to deep purple and what ever the name for that rich grey/brown/purple color is and I look like a million bucks in the winter. I'd be perfectly happy to have this travel pack be the only winter clothes in my closet. Thank you for sharing your thought process. I've been able to pack much lighter than most, but now I can really free myself from lugging and toting. My only variation would be to substitute some jewel toned tops and a scarf to go with all. We stay pretty close to home during the school year. But I love these travel vignette so much, I tend to plan my week's outfits from them. It's fun and it eliminates those morning closet quandaries. I don't take much more than this for my month-long trips to Europe. I learned how to do that from you. Thanks, Janice. We usually wash clothes weekly on those trips, or more often if we are in an apartment with a washer. My formula is one week +1 day. It usually results in 3 bottoms, 8 tops, 2 pairs of shoes, a cardigan or vest or jacket as needed and the usual undergarments and accessories. At least 2 scarves are required for any trip. I can fit all that and everything else I need in a 22" spinner carry on and a cross body messenger bag or tote. I could probably do with fewer tops if I didn't sweat or have a penchant for wearing my lunch! Yes I agree with everyone, these capsule wardrobes are so useful for so much other than travel. Thank you, Janice, for being such an inspiration. I'm loving my navy and taupe/tan wardrobe and just purchased a nice navy peacoat to alter with my long taupe coat. Almost everything is now coordinated. I do add colorful tops and scarves that go with both neutrals – teal, turquoise, golden yellow, lighter blue. Thank you thank you I have be one very careful about what I buy and finally know exactly what I really need and don't need!! It is fun! The first vignette speaks volumes to me. I love it! I am just adding my thanks for the inspiration you share with us Janice – I read your blog every day but just don't say thank you often enough. You have both taught and inspired me many times, especially your travel capsule posts. So thank you! I love these travel vignettes too, Janice! And special thanks for the timeliness of this. I sock away the travel vignettes that I can use with my wardrobe and packing is so much easier. It was your travel vignettes nearly two years ago that got me hooked on your blog! I love the navy and grey. I love grey with almost any color. Let me add my thanks! And I want that coat!!! I agree that you've helped me pack for trips and just generally curate my wardrobe. I read you everyday. I have never commented on your blog before but I wanted to tell you how much I enjoy your blog and how much your Four-Pack posts helped me during a recent trip. I started by choosing my outerwear and boots since our destination in northern Alberta, Canada, was experiencing temperatures of -21 Celsius! I then chose two scarves that coordinate with my coat but could still be used to accent outfits. Then I chose the rest of my pieces in the tan, black and gray hues that my scarves were comprised of. I packed only four items (plus undergarments) but at the last minutes got scared that I would run out of things to wear so I threw in one extra tee shirt! I ended up with a variety of outfits that were appropriate for every event we attended and were warm, comfortable and looked good. And, as you probably guessed, I didn't wear the extra tee shirt! I am a covert to the Four-Pack, and am planning ahead for a pre-Christmas weekend getaway to lovely Lake Louise, Alberta in a few weeks. I'm thinking Christmas Plaid accented by red and black. Any ideas or suggestions? Thanks again for all your inspiration! Thank you for explaining the process – it makes so much sense. I would love to hear the process behind varying the look with shapes and mood. Your sets look so different with combination of pieces. Mine look all the same just in different colors.